At the E3 press conference in June, we got a first look at Destiny: The Taken King's gameplay and new Guardian subclasses (Warlock's Electrical Storm, Hunter's Void Bow, and the Titan's Solar Hammer), and Guardians have one more month of waiting before finally taking on the Fallen Hive King Oryx. With enough content that is double the size of Destiny's two previous DLCs, The Taken King is packed with big upgrades you're going to be excited for. 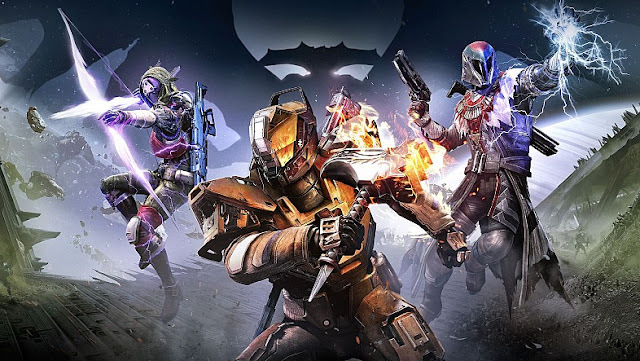 Since its release in September 2014, Destiny has been notorious for its conflated and unusual progression system, and The Taken King will not be left out of Bungie's trend in changing the level progression with each DLC. Destiny's third expansion, to be released next month, will rely solely on the player's experience gains to reach the new level cap of 40. From the beginning, XP was used to reach level 20 and was replaced by "Light" to further level up. Grinding in Strikes, Crucible, and Raids became an annoying obligation in order to search for armor drops with increased Light, making many players stuck at a lower level until the sporadic loot drop favored them. It only got worse when The Dark Below introduced Vanguard and Crucible Commendations that were used to buy new armor or weapons, and the only way to obtain one was to fully rank up again and again. The House of Wolves introduced its own way to obtain its level 34 cap by requiring Etheric Light from completing Level 35 Prison of Elders to level up current armor or by obtaining Armor Cores to buy gear from Veriks. Vanguard and Crucible marks were once again the regular form of currency, but for players without a strong fire team, the absence of matchmaking in Prison of Elders past level 28 meant many were stuck on level 32. According to GameInformer, "experience now feeds directed into your level progression all the way from one to the new level cap of 40," making Light no longer useful—though how it actually ties into what little of the storyline we know of has yet to be explained since the Hive thirst for the guardian's light. This traditional way of leveling up allows experience to determine what level you are, not what your character is wearing. Though new armor and weapons will provide increased power, they will be unlocked as you level up instead of the current open level 20. "The conflation of gear and character level led to this place where your identity was determined by things outside of your control, creative director Luke Smith told GameInformer. "We don't want to do that." Although loot will no longer determine your level, Bungie will also be upgrading how the loot is dropped. The new algorithm will now pay closer attention to what the player already has when determining what to drop so they will receive loot meaningful to their level. That also means less drops of items already attained [finally, because I have no need for five of "Her Right Hand"]. Current Crucible and Vanguard marks will be replaced with Legendary marks while "Armor Materials" will replace Hadronic Essence, Sapphire Wire, and Plasteel Plating. Wearing class items will no longer be required to gain reputation; instead Guardians will "pledge allegiance" to a faction. Players have so far grown accustomed to Peter Dinklage's voice behind the Ghost, but that is all about to change in The Taken King. Destiny's two previous expansions saw a complete absence of the Ghost's narrative, though GameInformer reported that the Ghost will have an even more important role within the game and will be replaced by voice actor Nolan North (Uncharted, Assassin's Creed). North will be redoing all of the current dialogue to maintain consistency throughout the game and will bring his own touch to the character, adding a more current connection to the Guardian. The Taken King will be packed with narrative-driven story that includes over eight new missions, eight new Crucible maps with three new modes—Mayhem, Rift, and Zone Control—strikes, class quests, and the final raid—King's Fall. The Taken King will be available September 15 on disc and digital download. and stay tuned to Fanboys Anonymous for all your geek news!